This last weekend was the first time I touched my 510 this year -- it's been about three months since the last time I worked on it. I've had the engine out of the car for three months now, waiting for me to reinstall the flywheel, tighten up the front cover (to deal with a small oil leak), and to throw it back into the bay. 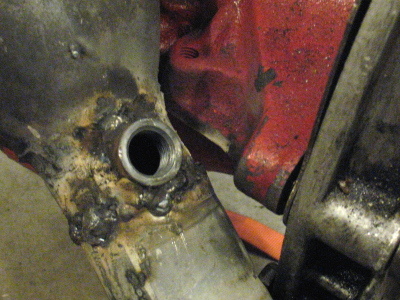 While the engine was out, I also carved out a hole in the exhaust and welded in a bung for an O2 sensor. Even though the engine isn't fuel injected, having an O2 sensor is a good way to tune the carburetor -- it's an instant check on the fuel mix, and it's a heck of a lot easier than pulling the plugs and trying to tell the mixture from their color. 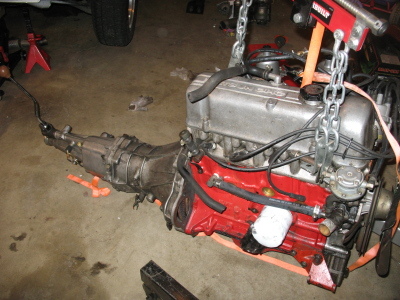 While trying to reinstall the engine, I recalled why it's a good idea to pull the engine and transmission out as a single unit. It's because trying to reinstall an engine with the transmission still under the car is a pain. A terrible, horrible pain. I spent about half an hour trying, and finally gave up and yanked the engine back out again, and then pulled the transmission out from under the car (leaking transmission fluid everywhere).